In high school, rather than opting to study a “normal” foreign language, like Spanish or German, I chose to take Latin. You might think I made this decision because it would be helpful for the SATs (it was) or because all the cool kids were doing it (they weren’t), but the truth is, I knew that with Latin, no native-speakers would have to be assaulted by my embarrassing pronunciations. While my classmates did end up being subjected to a (Grammy-worthy) performance of a translated-into-Latin Outkast song, taking Latin ended up being a great decision, as it fueled a love of linguistic anthropology that I followed into college. It’s because of those classes that I know that the word “champion” comes from the Latin “campus,” which was their word for a place where the action (battles, usually) happens. So you might say a champion is someone who takes action. 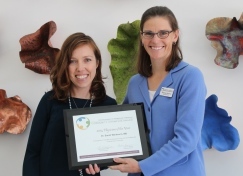 This year’s Physician of the Year Award went to Dr. Sarah Winbourn, a pediatrician at Kids First Health Care. In addition to providing compassionate, culturally-sensitive care to her patients, she also teaches other community providers, in order to elevate care at all levels, and took the initiative to better connect all the health care resources in her community. Ken Davis, a physician assistant at Mountain Family Health Centers, received a Non-Physician Provider of the Year award for his leadership in Whole Person Care, gentle mentorship of his colleagues, and his dedication to improving the patient experience. Jeff Martin of Open Bible Medical Clinic also received a Non-Physician Provider of the Year award for his tireless efforts to provide care to those in need. He opened a free clinic and a free pharmacy in his community and is a 20-year veteran of the Colorado Springs Fire Department. Our Advocate of the Year Award went to Jennifer Hill of the Colorado Mental Wellness Network, whose commitment to educating elected officials about mental health issues, training police officers in crisis intervention, and working with Coloradans recovering from mental illness have had an important impact on mental health care in Colorado. Our last award—for Lifetime Achievement—was won by Paul Major of the Telluride Foundation. Over the past fifteen years that he’s led his organization, Paul has taken action to better serve the western slope’s immigrant community, increase access to health care and non-emergent transportation, build new childcare centers, and developed a business-accelerator program that has added jobs and diversified Telluride’s economy. We at CCMU would like to take the opportunity to thank these incredible winners, and all the nominees, for the important and impressive work they do to drive change in health care. If there is one clear message we heard from Liz Baxter, our luncheon’s keynote speaker, it is that it will take all of us to achieve our vision of a healthier Colorado; we’re grateful these Community Champions are leading the way. The “campus” needs more champions! Join us in the crusade for Colorado’s future!